" Relations between Jews and Catholics are under immense strain after a bishop made controversial remarks on his blog. 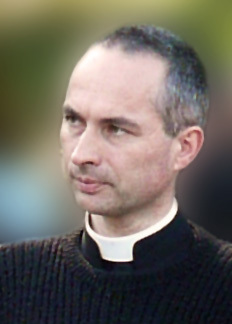 Last month, Régis de Cacqueray,(pic above) the head of the French SSPX chapter, also accused Jews of deicide. To the despair of Jewish groups, there has been increased dialogue between the Vatican and SSPX. Goldschmidt said: "Comments like these take us back decades to the dark days before there was a meaningful and mutually respectful dialogue between Jews and Roman Catholics. There must be no rapprochement within the Catholic church for those of its flock who seek to preach words of hate." The Vatican has said SSPX will have to sign up to core teachings if they are to reintegrate, although it has not stated what these are. Four SSPX bishops, including Williamson, were excommunicated in 1988 when they were illegally ordained. But the Vatican lifted Williamson's excommunication on the very day that his Holocaust-denying remarks were aired. The decision appalled Jewish leaders, with many suspending contact with the Vatican as a result. The Vatican said it did not know Williamson held such views. Williamson has repeatedly ignored pleas to retract his remarks and not even the pope has managed to get the cleric to recant. The fresh row will embarrass the pope, who is preparing to host a summit of world faith leaders in Assisi, Italy, next week as part of his interreligious outreach programme." Twenty five plus years ago, as a young man exploring religious vocation I visited the SSPX Seminary in Ridgefield, CT. I arrived on a weekend, after being shown to my room, and having some time before communal prayer, I wandered about finding a bookstore run for families that attended the Tridentine mass at the seminary chapel. While perusing books at that bookstore I was horrified to find copies of the "Protocols ofthe Elders of Zion" on sale. I believe that Fr. Williamson was a superior there at that time. I immediately went back to my room, packed, called a taxi and got the heck out of there. I have never been able to understand the rampant and vicious anti-Semitism that seems to imbue SOME (luckily a small number) traditional Catholics. How can Benedict XVI have a doctrinal rapproachment with groups espousing such vile hatred and lies?